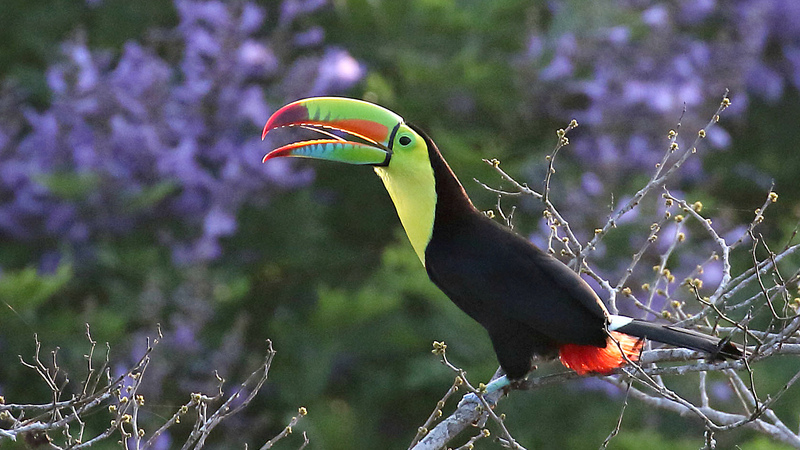 Very much an iconic tropical species, we saw many Keel-billed Toucans during our week of birding. Photo by participant Myles McNally. Highlights of the trip were many and included the usually very secretive Great Tinamou just off Pipeline Road, a few Rufescent Tiger-Herons at Ammo Pond, a single Boat-billed Heron, a perched Gray-headed Kite, beautiful Swallow-tailed Kites, big numbers of migrating Broad-winged and Swainson's hawks, the quite rare Lesser Black-backed Gull on the beach, a great experience with our Pheasant Cuckoo, a Spectacled Owl tucked into the trees, both Great and Common potoos on day perches, several great hummingbirds including Rufous-crested Coquette and Long-billed Starthroat, six species of trogons, Tody Motmot, nice looks at a Northern Emerald-Toucanet, a tiny Moustached Antwren, a singing Streak-chested Antpitta, good views of the endemic Yellow-green Tyrannulet, Blue Cotingas, the very difficult to find Speckled Mourner, Green Shrike-Vireo, our male Rosy Thrush-Tanager, Orange-billed Sparrow, and those Crested Oropendolas building their nests. We also did well in the mammal department with a nocturnal Central American Wooly Opossum, tent-making bats huddled under a palm frond, four species of monkeys, nice looks at both Two-toed and Three-toed sloths, and White-nosed Coati. Also, on my return to the Canopy Lodge, Tino had done some more sleuthing on the snake some of you saw and decided it was a Scorpion-eating Snake (probably degenhardtii). GREAT TINAMOU (Tinamus major) – We heard these a few times at dawn and dusk but we also had an okay look at one along Pipeline Road that Jorge spotted as we walked along. We even got it in the scope with only part of the face visible through the vegetation. BLACK-BELLIED WHISTLING-DUCK (Dendrocygna autumnalis) – There were a couple on the large lagoon at Juan Hombron. FULVOUS WHISTLING-DUCK (Dendrocygna bicolor) – Rather uncommon here, we saw two at Juan Hombron. CRESTED BOBWHITE (Colinus cristatus) – We had about six birds calling from the edge of the road at Juan Hombron. After a lot of effort they flushed and flew directly away. WOOD STORK (Mycteria americana) – A handful were seen soaring over the Pacific lowlands. This Plumbeous Kite was one of good number migrating with Broad-winged and Swainson’s hawks that we watched from the Canopy Tower. Photo by participant Stan Lilley. MAGNIFICENT FRIGATEBIRD (Fregata magnificens) – There were a fair number off the coast at Santa Clara. BROWN BOOBY (Sula leucogaster) – A write-in that we forgot to add on our final day's list, we saw at least two birds flying over the ocean at Santa Clara. ANHINGA (Anhinga anhinga) – One was spotted by a few of us as it flew over the Summit Pond area. RUFESCENT TIGER-HERON (Tigrisoma lineatum) – A quite handsome species, we saw two adults and a heavily "tigered" immature at Ammo Pond. SNOWY EGRET (Egretta thula) – At least one was at the large lagoon at Juan Hombron. TRICOLORED HERON (Egretta tricolor) – This and the above species were both seen at the lagoon at Juan Hombron. GREEN HERON (Butorides virescens) – We saw a few in the canal area. Some were in close association with the similar Striated Herons. BOAT-BILLED HERON (SOUTHERN) (Cochlearius cochlearius panamensis) – We had pretty good scope views of a single bird trying to hide in the forest at the edge of Summit Pond. WHITE IBIS (Eudocimus albus) – There were two at Juan Hombron. GLOSSY IBIS (Plegadis falcinellus) – A handful were seen at the lagoon at Juan Hombron. BLACK VULTURE (Coragyps atratus) – This and the following were a few of the birds we saw every day of the trip. LESSER YELLOW-HEADED VULTURE (Cathartes burrovianus) – In the Pacific lowlands we had a couple of nice looks at this unusual species. KING VULTURE (Sarcoramphus papa) – Alexis spotted a single bird flying over Pipeline Road. Unfortunately, we only got poor views as we got quick looks between the trees. A species of the foothills and mountains in Panama, and often a hard one to find, we ended up with nice views of Orange-bellied Trogon. Photo by participant Stan Lilley. OSPREY (Pandion haliaetus) – Stan spotted our first one as we were waiting at the bridge along the Panama Canal. WHITE-TAILED KITE (Elanus leucurus) – We saw one in the Juan Hombron area. GRAY-HEADED KITE (Leptodon cayanensis) – We had great looks at a calling and perched individual near the beginning of Pipeline Road. This is a tough one to see this well. SWALLOW-TAILED KITE (Elanoides forficatus) – Near the Canopy Lodge we saw a couple of these, one of the most handsome raptors in the world. DOUBLE-TOOTHED KITE (Harpagus bidentatus) – We saw three of these, with a long thin tail flying above the forest along Pipeline Road. 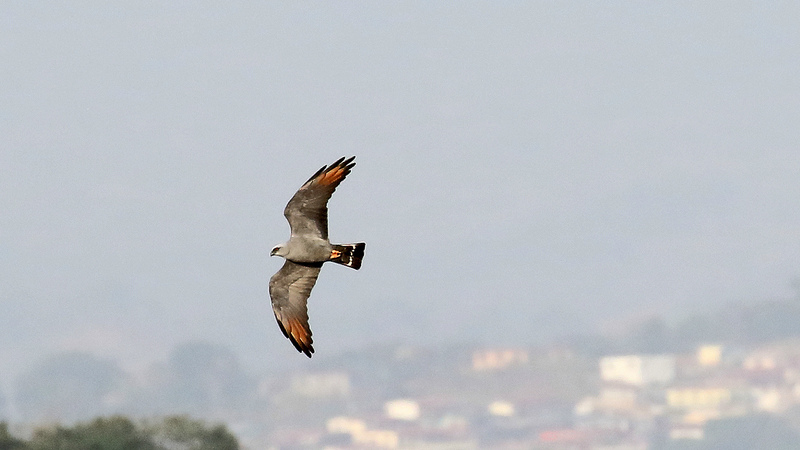 PLUMBEOUS KITE (Ictinia plumbea) – On our first morning we had a few migrating over at the Canopy Tower. The previous afternoon some of us saw a perched individual from the top of the tower that we saw well in the scope. PLUMBEOUS HAWK (Cryptoleucopteryx plumbea) – This may well have been the hawk that Stan and I saw fly off the ground along Pipeline Road. We saw a single white tail band but didn't get a super view of it. SAVANNA HAWK (Buteogallus meridionalis) – We saw a couple of these open country specialists in the lowlands near the Pacific coast. GREAT BLACK HAWK (Buteogallus urubitinga urubitinga) – One flew by while we birded at the Discovery Center Tower. BROAD-WINGED HAWK (Buteo platypterus) – A good number, several hundred, were seen on a couple of the days as they migrated over the Canopy Tower. SWAINSON'S HAWK (Buteo swainsoni) – We saw many headed back north from their wintering grounds in Argentina. A great sight! SUNBITTERN (Eurypyga helias) – One of the more bizarre birds in the New World, we had great looks at one sitting on a nest along the river near the Canopy Lodge. GRAY-COWLED WOOD-RAIL (Aramides cajaneus) – Several folks saw this large rail near the feeder at the Canopy Lodge. PURPLE GALLINULE (Porphyrio martinica) – We saw at least one at Ammo Pond. SOUTHERN LAPWING (Vanellus chilensis) – Several were seen well including one that showed the red spur on the wing quite well. WATTLED JACANA (Jacana jacana) – A good number were seen at Ammo Pond each time we passed. SANDERLING (Calidris alba) – A group of ten were seen on the beach at Santa Clara. These birds are headed a long way, it is one of the furthest north breeding birds in the world. WILLET (Tringa semipalmata) – A few were on the beach at Santa Clara. LESSER YELLOWLEGS (Tringa flavipes) – A single individual was seen at the lagoon at Juan Hombron. LESSER BLACK-BACKED GULL (Larus fuscus) – We had a first winter individual on the beach at Santa Clara in a large flock of Laughing Gulls. This appears to be the first record away from the Panama Canal estuaries for the country. ROYAL TERN (Thalasseus maximus) – A few were with the large flock on the beach at Santa Clara. SANDWICH TERN (Thalasseus sandvicensis) – A flock of at least 100 individuals was loafing on the beach in front of our lunch spot at Santa Clara. I think this is one of the prettiest of the terns. ELEGANT TERN (Thalasseus elegans) – Two individuals were seen in the large tern flock at Santa Clara. The long thin yellow bill identifies this from the similar Royal Tern. This female Barred Antshrike popped up for a nice look while we were birding at Ammo Pond. Photo by participant Stan Lilley. SCALED PIGEON (Patagioenas speciosa) – We saw a couple or three perched in tree tops from both of the towers we visited. PLAIN-BREASTED GROUND-DOVE (Columbina minuta) – We saw a few of these small doves walking about in the road in the Juan Hombron area. GRAY-CHESTED DOVE (Leptotila cassinii) – We had quick looks at a couple of these forest doves in the Canal Zone area. SMOOTH-BILLED ANI (Crotophaga ani) – Several were seen near the ponds in the canal area. GROOVE-BILLED ANI (Crotophaga sulcirostris) – We saw a couple in the Juan Hombron area. PHEASANT CUCKOO (Dromococcyx phasianellus) – One of the trip highlights was first hearing this unusual species calling along Pipeline Road as we drove along. We got out and tracked it down only to have a monkey flush it twice from perches. We kept at it and finally ended up with a great look. This is a species that becomes much more vocal with the onset of the rainy season so they were just beginning to call. SQUIRREL CUCKOO (Piaya cayana) – A handful of these large cuckoos were seen well. TROPICAL SCREECH-OWL (Megascops choliba) – Tino spotted one on a day roost at the edge of the sports field in El Valle. It was tucked neatly into a bromeliad laden tree. SPECTACLED OWL (Pulsatrix perspicillata) – After much searching where we knew there was an individual above El Valle, the gardener, Anibel, came to the rescue and located this handsome owl tucked under a dense tangle of vegetation. MOTTLED OWL (Ciccaba virgata) – Tino found this very camouflaged owl perched in the dense forest at the Canopy Lodge. COMMON PAURAQUE (Nyctidromus albicollis) – On our night drive at the Canopy Tower we caught the eyeshine of this forest edge species and ended up with a pretty good view. 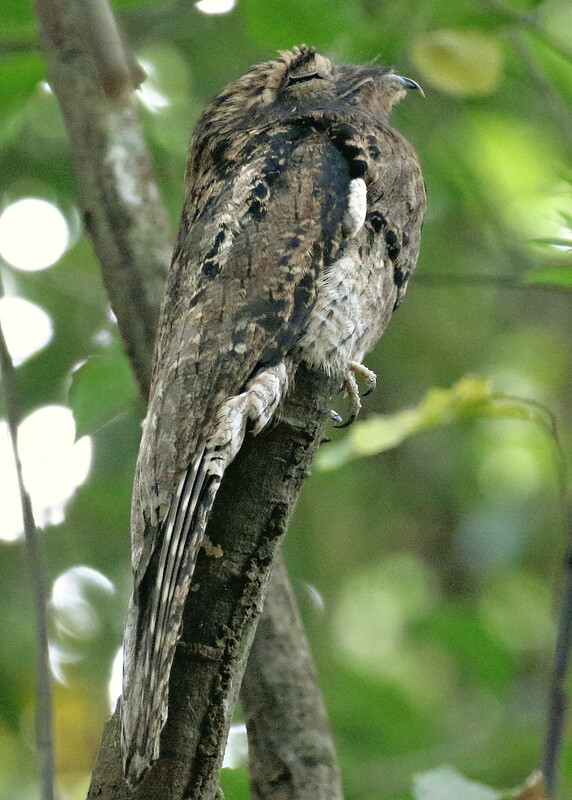 GREAT POTOO (Nyctibius grandis) – Alexis led us to a site along Pipeline Road and located this large and unusual species on a day perch and possibly a nest site. A very camouflaged species, we probably walked right by a few others in our treks. COMMON POTOO (Nyctibius griseus) – Alexis came through again with a perched individual along the trail at Metro Park. It is incredible how this species blends in to the forest. SHORT-TAILED SWIFT (Chaetura brachyura) – A handful were seen in the Canopy Tower area. The nearly tailless shape is quite distinctive. BAND-RUMPED SWIFT (Chaetura spinicaudus) – These were the most prevalent swifts we saw from the Canopy Tower. LESSER SWALLOW-TAILED SWIFT (Panyptila cayennensis) – On our arrival afternoon, a few of us had a nice look at this solitary and somewhat uncommon species. An expert at camouflage, one wonders how many potoos you walk right past in the forest. Alexis spotted this Common Potoo at Metro Park. Photo by participant Stan Lilley. WHITE-NECKED JACOBIN (Florisuga mellivora) – These were almost never out of sight at the feeders at the Canopy Tower. GREEN HERMIT (Phaethornis guy) – This large hummingbird made an appearance at a flower along the Las Minas trail near the Lodge. LONG-BILLED HERMIT (Phaethornis longirostris) – There was at least one individual that made infrequent visits to the feeders at the Tower and at the Discovery Center. PURPLE-CROWNED FAIRY (Heliothryx barroti) – Along the Old Gamboa Highway near Summit Pond we had good views of a perched individual. This is a quite distinctively plumaged large hummingbird. BLACK-THROATED MANGO (Anthracothorax nigricollis) – A few were seen here and there. VERAGUAN MANGO (Anthracothorax veraguensis) – We had nice looks with Tino along the roadside in the Juan Hombron area. This is one of the handful of species that are endemic to Panama. RUFOUS-CRESTED COQUETTE (Lophornis delattrei) – We had great views of this tiny yet elaborately plumaged hummingbird near the visitor's center at the Discovery Center. LONG-BILLED STARTHROAT (Heliomaster longirostris) – We enjoyed a scope view of a perched individual at Cara Iguana. GARDEN EMERALD (Chlorostilbon assimilis) – A female, not one of the snazziest of the hummingbirds, was seen in the Juan Hombron area. VIOLET-HEADED HUMMINGBIRD (Klais guimeti) – A few folks saw this species at the verbena flowers at the Canopy Lodge. BRONZE-TAILED PLUMELETEER (Chalybura urochrysia) – We saw this species with the pink feet along the Las Minas Trail. CROWNED WOODNYMPH (Thalurania colombica) – I'm not sure we ever had a great view of this mid-elevation species near the Canopy Lodge. BLUE-CHESTED HUMMINGBIRD (Amazilia amabilis) – Rather common around the Canopy Lodge; this is a common voice in the forest as it chips and chips. SNOWY-BELLIED HUMMINGBIRD (Amazilia edward edward) – Our first was seen well from the top of the Canopy Tower and we also saw one repeatedly at the feeder area at Canopy Lodge. RUFOUS-TAILED HUMMINGBIRD (Amazilia tzacatl) – This is one of the more widespread tropical hummingbirds. SAPPHIRE-THROATED HUMMINGBIRD (Lepidopyga coeruleogularis) – We saw a couple of these in the Juan Hombron area. VIOLET-BELLIED HUMMINGBIRD (Juliamyia julie) – A forest species, we saw a couple near the Lodge and again in the Pipeline area. 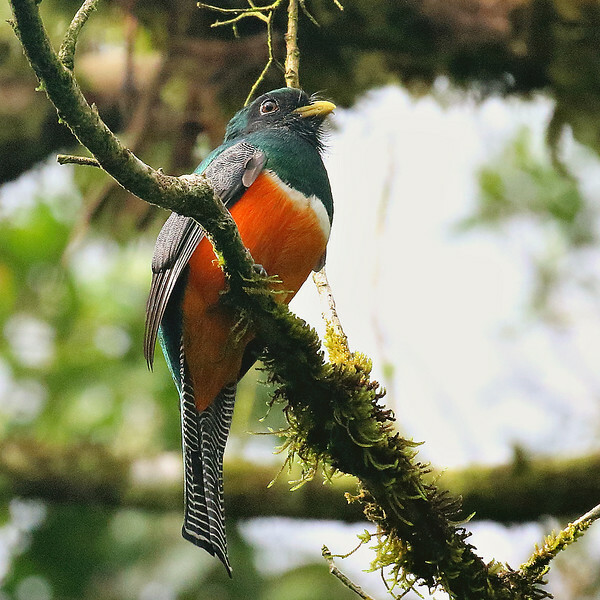 SLATY-TAILED TROGON (Trogon massena) – We heard several before we saw our first one along Pipeline Road. BLACK-TAILED TROGON (Trogon melanurus) – This was the first of six species of trogons we saw on our trip. GARTERED TROGON (Trogon caligatus) – We had a pretty good view of one perched below us as we birded from the Discovery Center tower. BLACK-THROATED TROGON (Trogon rufus) – This is a very handsomely colored trogon with its green and yellow plumage. ORANGE-BELLIED TROGON (Trogon aurantiiventris) – Often a difficult to find species, we enjoyed close views of one along the Las Minas tail. TODY MOTMOT (Hylomanes momotula) – This one took some time and effort, but we finally got a good scope view of a calling bird at the Canopy Lodge. A quite local species throughout its range, it is always a good day when you see this bird. LESSON'S MOTMOT (Momotus lessonii lessonii) – Formerly known as Blue-crowned Motmot, this is a split from that form and very similar to the Whooping Motmot that we saw in the lower elevation Canal area. RUFOUS MOTMOT (Baryphthengus martii) – One or two were frequent visitors to the banana feeder at the Canopy Lodge. BROAD-BILLED MOTMOT (Electron platyrhynchum) – We ended up seeing a handful of these in the forests at Semaphore Hill and in the Pipeline Road area. AMAZON KINGFISHER (Chloroceryle amazona) – A female was seen at Summit Pond. GREEN KINGFISHER (Chloroceryle americana) – A nicely marked male was seen well at Summit Pond. AMERICAN PYGMY KINGFISHER (Chloroceryle aenea) – Two of these great little kingfishers were seen well at Summit Pond. BLACK-BREASTED PUFFBIRD (Notharchus pectoralis) – We first heard this bird calling as we walked down Semaphore Hill and managed to see it quite well from both sides. Two days later we saw another on Pipeline Road. WHITE-WHISKERED PUFFBIRD (Malacoptila panamensis) – We had a nice view of one along the road at Semaphore Hill. SPOT-CROWNED BARBET (Capito maculicoronatus) – On our first afternoon at the Canopy Lodge, we walked up the road and found this odd species feeding in a fruiting fig along with a plethora of tanagers. NORTHERN EMERALD-TOUCANET (BLUE-THROATED) (Aulacorhynchus prasinus caeruleogularis) – Always a tough bird in the El Valle area, we had great looks at a calling bird along the Las Minas Trail. This species has recently been known as Blue-throated Toucanet as well. COLLARED ARACARI (Pteroglossus torquatus) – We had several views of this small toucan in the Canopy Tower and Pipeline area. YELLOW-THROATED TOUCAN (CHESTNUT-MANDIBLED) (Ramphastos ambiguus swainsonii) – Formerly known as Black-throated Toucan and Chestnut-mandibled Toucan, we saw a few from the Discovery Center Tower. KEEL-BILLED TOUCAN (Ramphastos sulfuratus) – We encountered many of these during our week, including at least ten in one tree on our first morning at the Canopy Tower. 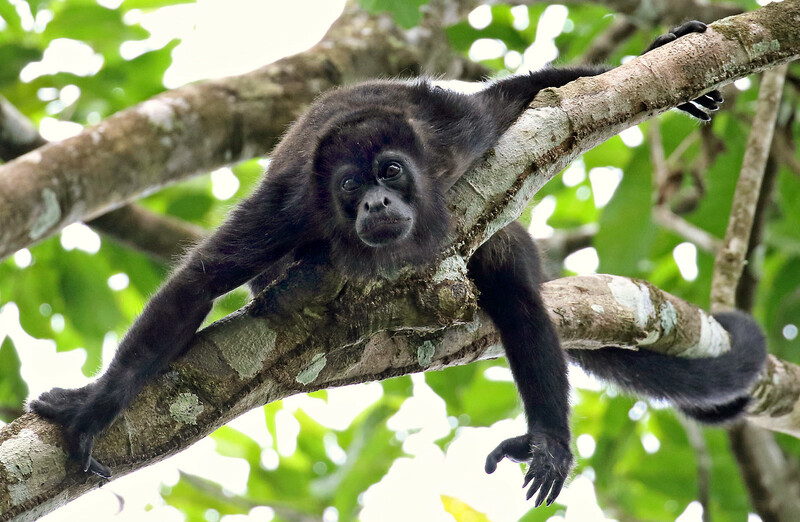 This curious Mantled Howler Monkey was as equally interested in us as we were in it. Photo by participant Myles McNally. CINNAMON WOODPECKER (Celeus loricatus) – We saw this crested woodpecker peering out of a nest hole along the road on Semaphore Hill. LINEATED WOODPECKER (Dryocopus lineatus) – This large woodpecker showed well a few times in the Canopy Tower area. CRIMSON-CRESTED WOODPECKER (Campephilus melanoleucos) – Less commonly encountered than the above species, we saw this large woodpecker along Pipeline Road and again at Metro Park. YELLOW-HEADED CARACARA (Milvago chimachima) – This is a rather common species in the lowlands of Panama and we saw several of them. PEREGRINE FALCON (Falco peregrinus) – Both of the individuals we saw were perched on cell towers near the city of Anton. ORANGE-CHINNED PARAKEET (Brotogeris jugularis) – A daily species, we saw these perched a few times, including a pair that seemed to be investigating a nest site at Metro Park. Many more were seen and heard flying overhead. BROWN-HOODED PARROT (Pyrilia haematotis) – We had okay views of this rather uncommon species. RED-LORED PARROT (Amazona autumnalis) – This was the most common of the bigger parrots we saw from the towers. YELLOW-CROWNED PARROT (Amazona ochrocephala) – Two flew over us as we birded along the dusty road at Juan Hombron. BROWN-THROATED PARAKEET (VERAGUAS) (Eupsittula pertinax ocularis) – We saw three fly just overhead at Metro Park where this is a quite uncommon species. Then we had a few more in the Pacific lowlands where it is more expected. FASCIATED ANTSHRIKE (Cymbilaimus lineatus) – A pair of these large antshrikes were seen well. BARRED ANTSHRIKE (Thamnophilus doliatus) – A female popped up for us near the Ammo Pond area on our afternoon visit there. BLACK-CROWNED ANTSHRIKE (Thamnophilus atrinucha) – We had a couple of good looks of this rather common forest antbird. This is a renaming of Western Slaty-Antshrike. 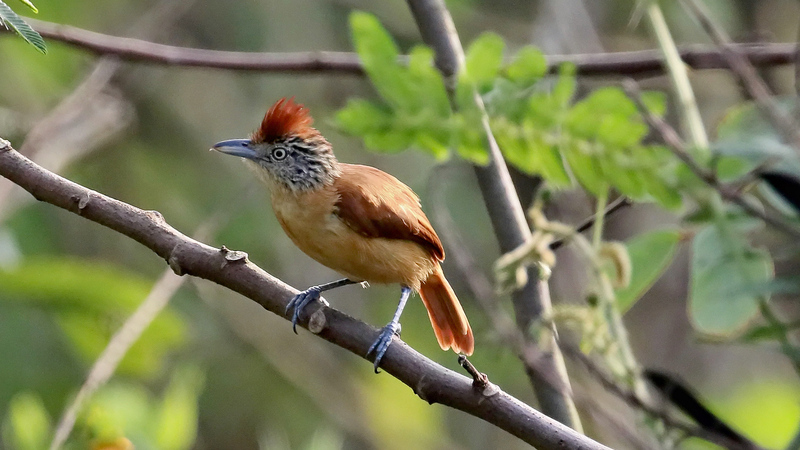 RUSSET ANTSHRIKE (Thamnistes anabatinus) – A rather uncommon bird throughout its range, we had good views of two individuals along the Las Minas Trail near El Valle. PLAIN ANTVIREO (Dysithamnus mentalis) – We had nice looks at this rather quiet species at the little barranco on La Mesa. SPOT-CROWNED ANTVIREO (Dysithamnus puncticeps) – A species with a somewhat limited range, we had a nice pair along Pipeline Road on our second visit there. The male was really singing away. Then we saw another at the barranco on La Mesa. CHECKER-THROATED ANTWREN (Epinecrophylla fulviventris) – Seen at the same two sites as the previous species, this is a bird that is almost always in the company of White-flanked Antwren. MOUSTACHED ANTWREN (Myrmotherula ignota) – Perhaps the smallest antbird (formerly known as Pygmy Antwren), we worked on seeing a singing individual in the trees for some time before getting a nice look. It even stayed put long enough to get it in the scope. 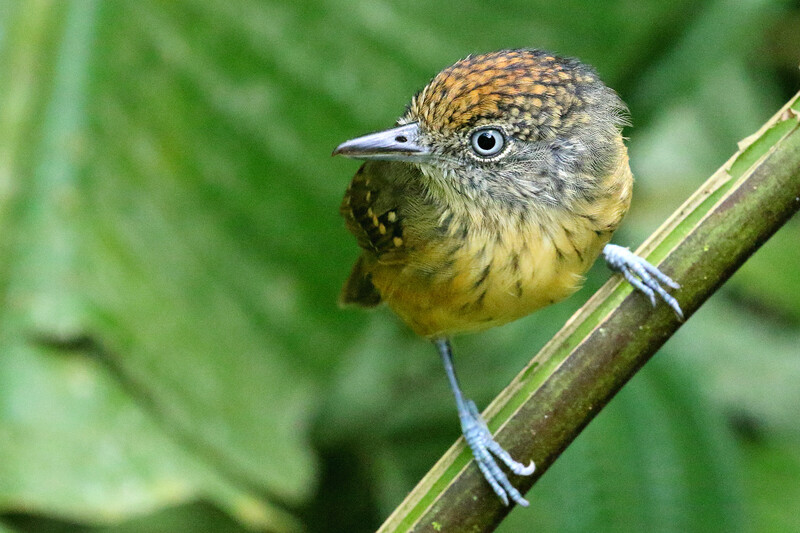 DOT-WINGED ANTWREN (Microrhopias quixensis) – This is a mixed-species flock leader in the forests. We saw a couple of them in the Pipeline Road area. Often found at army ant swarms, this Spotted Antbird posed nicely for us for several minutes along the road at Semaphore Hill. Photo by participant Myles McNally. DUSKY ANTBIRD (Cercomacroides tyrannina) – A bird of the thick undergrowth, we saw a pair on our first morning along the road going up Semaphore Hill. CHESTNUT-BACKED ANTBIRD (Poliocrania exsul) – A mostly terrestrial antbird, with bare blue skin around its eye, we had to work to see one in the forest along Pipeline Road. BICOLORED ANTBIRD (Gymnopithys bicolor bicolor) – Often associated with army ant swarms, Alexis spotted a single bird sitting motionless on a small branch near the ground along Pipeline Road. 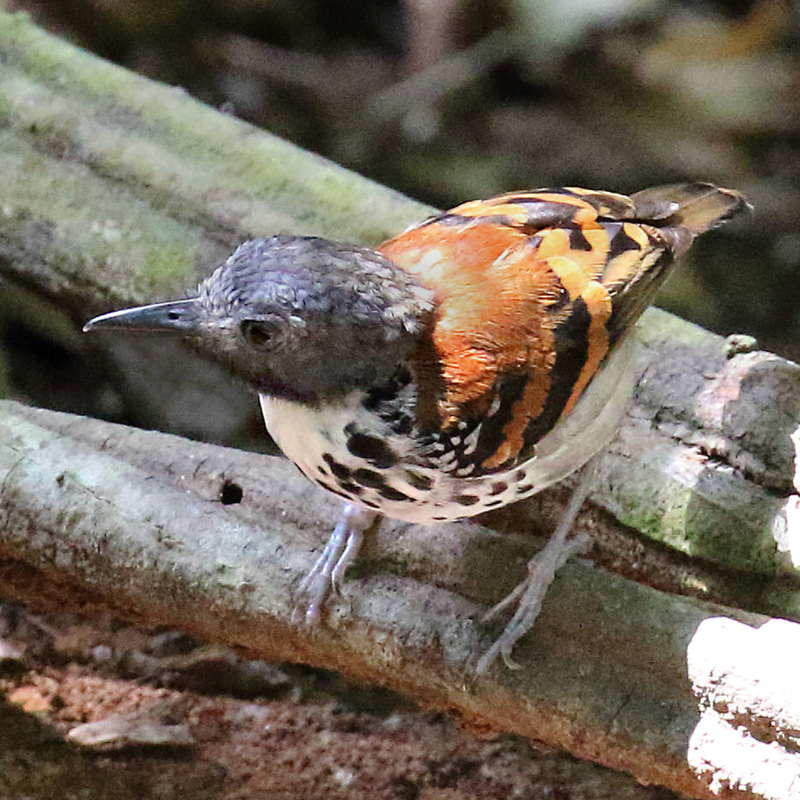 SPOTTED ANTBIRD (Hylophylax naevioides) – A very sharply marked antbird that is also often seen with army ants; we saw a couple or three during our time in the Canal Zone. STREAK-CHESTED ANTPITTA (Hylopezus perspicillatus) – This one took a lot of looking as it sang closer and closer to us. Finally Jorge spotted it through a hole in the vegetation. We managed to get a scope on it for a pretty fair view and it finally got flushed by a Black-faced Antthrush that walked up on its perch. BLACK-FACED ANTTHRUSH (Formicarius analis) – After this bird flushed the antpitta off of its perch, we saw bits and pieces of it moving through the vegetation before it walked to the edge of the little stream and started bathing in the open. COCOA WOODCREEPER (Xiphorhynchus susurrans) – We saw or heard this widespread species several days of the trip. BLACK-STRIPED WOODCREEPER (Xiphorhynchus lachrymosus) – We heard one calling and had a quick fly-by in the same area where we were looking at the Pheasant Cuckoo. SPOTTED WOODCREEPER (Xiphorhynchus erythropygius) – We had a nice view of this higher elevation species along the trail at Las Minas. PLAIN XENOPS (Xenops minutus) – An odd little bird, we had nice looks at a few, and especially the one tapping away on the rotting stump like a woodpecker. BROWN-CAPPED TYRANNULET (Ornithion brunneicapillus) – A rather common voice in the canopy of the forest, we had a good view from the top of the Canopy Tower on our first morning. SOUTHERN BEARDLESS-TYRANNULET (Camptostoma obsoletum) – We finally connected with this small flycatcher in the Pacific lowlands on our last morning. MOUSE-COLORED TYRANNULET (NORTHERN) (Phaeomyias murina eremonoma) – We had good views of this dry country specialist along the road at Juan Hombron. GRAY ELAENIA (CHOCO) (Myiopagis caniceps absita) – This species is one of the few small flycatchers that is sexually dimorphic. We saw a gray male and a greenish-colored female high in a tree along Pipeline Road. YELLOW-BELLIED ELAENIA (Elaenia flavogaster) – Nice looks were obtained at Ammo Pond. LESSER ELAENIA (Elaenia chiriquensis) – We saw a couple of these in the dry country in the El Valle area, It's like a miniature version of the preceding species. YELLOW-GREEN TYRANNULET (Phylloscartes flavovirens) – Another of the few endemic birds of Panama and a tough one to get a good view of, we saw a very nice individual at Metro Park that was moving with a loose flock near the tall building. BLACK-CAPPED PYGMY-TYRANT (Myiornis atricapillus) – This is essentially tied as being the world's smallest passerine. A forest species that is usually quite high in the trees, we managed to coax one out to a perch for a pretty fair view. BLACK-HEADED TODY-FLYCATCHER (Todirostrum nigriceps) – A much more difficult species to see than the preceding, we had a nice look at a cooperative individual at our first stop along the road up to La Mesa. EYE-RINGED FLATBILL (Rhynchocyclus brevirostris) – A few saw one at Metro Park with Alexis. OLIVACEOUS FLATBILL (Rhynchocyclus olivaceus) – This is the bird we spotlighted as it slept on a branch during our night drive at Semaphore Hill. GOLDEN-CROWNED SPADEBILL (Platyrinchus coronatus) – An oddly-shaped species and one of Marcie's targets, we made a big effort to see this on Semaphore Hill with no luck, but ended up seeing it well two days later along Pipeline Road. 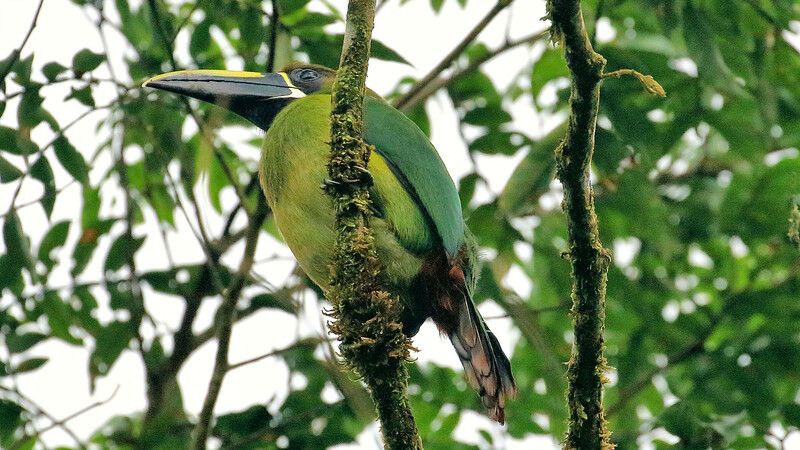 The Northern Emerald-Toucanet is often a tough species to find in the El Valle area, but we were fortunate to find a close one. Photo by participant Stan Lilley. TROPICAL PEWEE (Contopus cinereus) – We saw a calling individual at La Mesa. BRIGHT-RUMPED ATTILA (Attila spadiceus) – At our lunch stop on Pipeline Road, Stan called us back to where he had seen this species. We ended up with good views overhead. 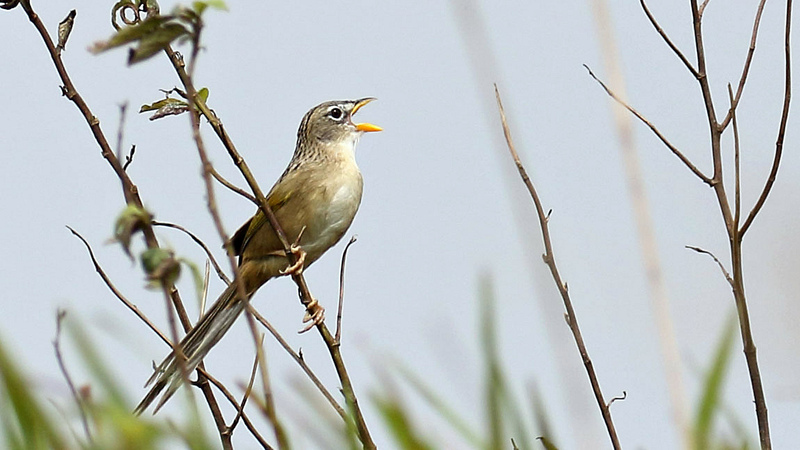 Its distinctive song was heard a few times during the week. PANAMA FLYCATCHER (Myiarchus panamensis) – Another local species, we had good views on the Juan Hombron Road. GREAT CRESTED FLYCATCHER (Myiarchus crinitus) – After hearing a few we finally saw this wintering species at Metro Park. They are already showing up as migrants in the southern US. LESSER KISKADEE (Pitangus lictor) – Always found near water we saw them at Ammo Pond and Summit Pond. BOAT-BILLED FLYCATCHER (Megarynchus pitangua) – We had a nice look in the dry country at Juan Hombron. RUSTY-MARGINED FLYCATCHER (Myiozetetes cayanensis) – Panama is one of the few places where you can see both this and the quite similar Social Flycatcher in the same place. PIRATIC FLYCATCHER (Legatus leucophaius) – An austral migrant that usually returns to breed in Panama in mid-January, we saw a couple and heard a few more in the open country. FORK-TAILED FLYCATCHER (Tyrannus savana) – There were a fair number of these good-looking flycatchers in the Pacific lowlands. More birders would like flycatchers more if they were as distinctive as this one. PURPLE-THROATED FRUITCROW (Querula purpurata) – The cotingas are an odd group of birds and this one is no exception. Its call carries a long way through the forest. We had a few birds seen and at least one male with a purple throat. BLUE COTINGA (Cotinga nattererii) – Alexis spotted two males at a good distance from the Discovery Center Tower. The electric blue color really shows well even from a distance. LANCE-TAILED MANAKIN (Chiroxiphia lanceolata) – A male was seen pretty well along the old road near Summit Pond. BLUE-CROWNED MANAKIN (Lepidothrix coronata) – A few of us saw a very nice male in the fruiting tree next to the top of the Canopy Tower on our first afternoon. GOLDEN-COLLARED MANAKIN (Manacus vitellinus) – A couple of stunning males were found right near the visitor's center at the Discovery Center. We even got one of the males in the scope. RED-CAPPED MANAKIN (Ceratopipra mentalis) – We saw these a few times but our best looks were from the Canopy Tower as they fed on the tiny fruits. Myles’ photo of these two Common Tent-making Bats perched under a palm frond was even better than the view we had in our scopes. Photo by participant Myles McNally. RUSSET-WINGED SCHIFFORNIS (Schiffornis stenorhyncha panamensis) – A calling bird was pretty cooperative and we ended up with good views of it along Pipeline Road. SPECKLED MOURNER (Laniocera rufescens) – This was one of the better sightings of the whole week. A quite uncommon species, we had a pretty good view through the scope of this subtly marked species. WHITE-WINGED BECARD (Pachyramphus polychopterus) – Nice looks at a singing male at Metro Park before we headed to the Canopy Lodge. RUFOUS-BROWED PEPPERSHRIKE (NORTHERN) (Cyclarhis gujanensis perrygoi) – A widespread species that is found north to Mexico, this bird is quite local in Panama. We did some searching and found a singing bird that ended up showing well for us on the way to the Pacific lowlands. GREEN SHRIKE-VIREO (Vireolanius pulchellus) – After a very nice view from the Canopy Tower for some of us on our first evening, we saw it again along the trail to the lagoon at the Discovery Center. LESSER GREENLET (Pachysylvia decurtata) – We saw one or two from the top of the Canopy Tower and heard them each day calling from the forest. YELLOW-GREEN VIREO (Vireo flavoviridis) – A nicely marked individual showed well at Juan Hombron. BLACK-CHESTED JAY (Cyanocorax affinis) – We finally connected with good views of this odd jay in the El Valle area. BLUE-AND-WHITE SWALLOW (Pygochelidon cyanoleuca) – A fly-by at La Mesa got away before we could get on it. NORTHERN ROUGH-WINGED SWALLOW (Stelgidopteryx serripennis) – A few migrants were flying about at the Ammo Pond area. SOUTHERN ROUGH-WINGED SWALLOW (Stelgidopteryx ruficollis) – This was the most commonly seen swallow we encountered. MANGROVE SWALLOW (Tachycineta albilinea) – We saw a few flying over the ponds and near the Canal. BARN SWALLOW (Hirundo rustica) – A good number were seen migrating past the Canopy Tower. BLACK-BELLIED WREN (Pheugopedius fasciatoventris) – After hearing a few we saw one well along Pipeline Road. RUFOUS-BREASTED WREN (Pheugopedius rutilus) – Our best view was at Metro Park where we got one overhead in a thicket for a nice view. RUFOUS-AND-WHITE WREN (Thryophilus rufalbus) – This bird has a beautiful voice. We heard and saw it at Metro Park. ISTHMIAN WREN (Cantorchilus elutus) – Formerly known as Plain Wren, we had a calling bird along the trail near Summit Pond. A rather local species in its range, we had a great look at this female and a male Spot-crowned Antvireo. Photo by participant Stan Lilley. LONG-BILLED GNATWREN (Ramphocaenus melanurus) – This odd species showed well for us at Metro Park. TROPICAL GNATCATCHER (Polioptila plumbea) – These were usually seen with mixed flocks and from the top of the Canopy Tower. WOOD THRUSH (Hylocichla mustelina) – Seen by a few folks near the compost pit at the Canopy Lodge. CLAY-COLORED THRUSH (Turdus grayi) – A species we saw daily with many of them feeding on bananas at the Canopy Lodge. WHITE-THROATED THRUSH (Turdus assimilis) – Tino found one for us in the fruiting tree up the road from the Canopy Lodge. This is a rather uncommonly seen species here. ROSY THRUSH-TANAGER (Rhodinocichla rosea) – Typically, this is a very hard-to-see species as it skulks in thick vegetation. But, we had great looks at a brilliant male picking through the vegetation at the edge of the compost pit at the Canopy Lodge. The color of the breast of the male is unique among birds. LOUISIANA WATERTHRUSH (Parkesia motacilla) – One was seen along the stream at the Lodge. BLACK-AND-WHITE WARBLER (Mniotilta varia) – We only saw a few of these wintering birds before they headed north. TENNESSEE WARBLER (Oreothlypis peregrina) – There was at least one that was hanging out at the Canopy Lodge feeders. MOURNING WARBLER (Geothlypis philadelphia) – Though we only saw one along a roadside near El Valle, this is where the majority of these winter before heading back north. BAY-BREASTED WARBLER (Setophaga castanea) – This is the most common of the North American breeding warblers in Panama. We saw a handful but not as many as we hoped. BLACKBURNIAN WARBLER (Setophaga fusca) – I believe our only one was along the trail at Las Minas. RUFOUS-CAPPED WARBLER (CHESTNUT-CAPPED) (Basileuterus rufifrons mesochrysus) – We saw a couple or three in the El Valle area but I don't think we saw one at the feeder at the Canopy Lodge. BUFF-RUMPED WARBLER (Myiothlypis fulvicauda) – This is a species that is usually found right along the stream courses. We saw ours at the compost pit just a few meters from the stream. GRAY-HEADED TANAGER (Eucometis penicillata) – Often an army ant follower, we had a quick look without ants along Pipeline Road. WHITE-SHOULDERED TANAGER (Tachyphonus luctuosus) – A rather common bird in flocks throughout the sites we birded. TAWNY-CRESTED TANAGER (Tachyphonus delatrii) – The Canopy Lodge area is the best place I have been to see this species. We had our best looks along the Las Minas Trail. FLAME-RUMPED TANAGER (LEMON-RUMPED) (Ramphocelus flammigerus icteronotus) – This was a common visitor to the feeders at the Lodge. GOLDEN-HOODED TANAGER (Tangara larvata) – A pretty fancy bird for a common tanager, we saw several. PLAIN-COLORED TANAGER (Tangara inornata) – Well named. It took a bit of watching, but we finally had great views of this singing Wedge-tailed Grass-Finch above Ell Valle. Photo by participant Myles McNally. BAY-HEADED TANAGER (Tangara gyrola) – We saw several around the Canopy Lodge with most of them in the fruiting tree just up the road. SILVER-THROATED TANAGER (Tangara icterocephala) – Another fancy tanager, we had a couple of views. BLUE DACNIS (Dacnis cayana) – Our best views may have been from the top of the Canopy Tower. WEDGE-TAILED GRASS-FINCH (Emberizoides herbicola) – We heard this bird calling down the slope at the top of the La Mesa Trail and it took quite awhile for us to get a good look at it, then it popped up for a great study. BLUE-BLACK GRASSQUIT (Volatinia jacarina) – There were a few seen along the roadsides. RUDDY-BREASTED SEEDEATER (Sporophila minuta) – A single male was seen in the Juan Hombron area. YELLOW-FACED GRASSQUIT (Tiaris olivaceus) – These were pretty common along the road edges above the Canopy Lodge. BLACK-HEADED SALTATOR (Saltator atriceps) – Mostly a species of the Atlantic slope in Panama, we saw a few above the Lodge where some of those birds creep over to the Pacific side. BLACK-STRIPED SPARROW (Arremonops conirostris) – We had good looks at this towhee-like sparrow along the road to La Mesa. ORANGE-BILLED SPARROW (Arremon aurantiirostris) – We had a pretty good view of this snazzy bird at the compost pit. DUSKY-FACED TANAGER (Mitrospingus cassinii) – Not one of the prettiest tanagers, but we saw a handful near the Lodge. RED-THROATED ANT-TANAGER (Habia fuscicauda) – We had a couple along Pipeline Road and again at Metro Park. PAINTED BUNTING (Passerina ciris) – We saw a male, sort of, along the trail at Summit Pond. A very rare bird in Panama, this bird had been around for several weeks and it was just visible over a short rise in the road. EASTERN MEADOWLARK (Sturnella magna) – A handful were seen in the pastures along the road on our way into Juan Hombron. CRESTED OROPENDOLA (Psarocolius decumanus) – On our drive to the Pacific lowlands, Tino stopped at a spot that had three nests under construction, with both females and the larger males making frequent stops as they wove the bits of vegetation into the pendulum-like nests. One of the most colorful of the monkeys, Red-naped Tamarins came in to feed on bananas during our lunch break at the Canopy Tower. Photo by participant Stan Lilley. CHESTNUT-HEADED OROPENDOLA (Psarocolius wagleri) – These were quite common in several areas and were prevalent at the Canopy Lodge feeders whenever fresh bananas were put out. SCARLET-RUMPED CACIQUE (SCARLET-RUMPED) (Cacicus uropygialis microrhynchus) – We saw a few along Semaphore Hill including a pair working on a nest. YELLOW-BACKED ORIOLE (Icterus chrysater) – We had nice looks at Ammo Pond on our first afternoon. GIANT COWBIRD (Molothrus oryzivorus) – This large cowbird was seen above the Lodge along the La Mesa Road. YELLOW-CROWNED EUPHONIA (Euphonia luteicapilla) – We saw a couple in the Cara Iguana area. THICK-BILLED EUPHONIA (Euphonia laniirostris) – This was the common euphonia we encountered and it was seen many times picking at bananas at the feeder at the Canopy Lodge. COMMON OPOSSUM (Didelphis marsupialis) – A few folks saw this on the feeder tray at the Canopy Lodge after dark. CENTRAL AMERICAN WOOLY OPOSSUM (Caluromys derbianus) – On our first evening at dinner at the Canopy Tower, we saw one grabbing a banana in a tree outside the dining room. Two nights later, some of us saw one scamper through the dining room during dinner. 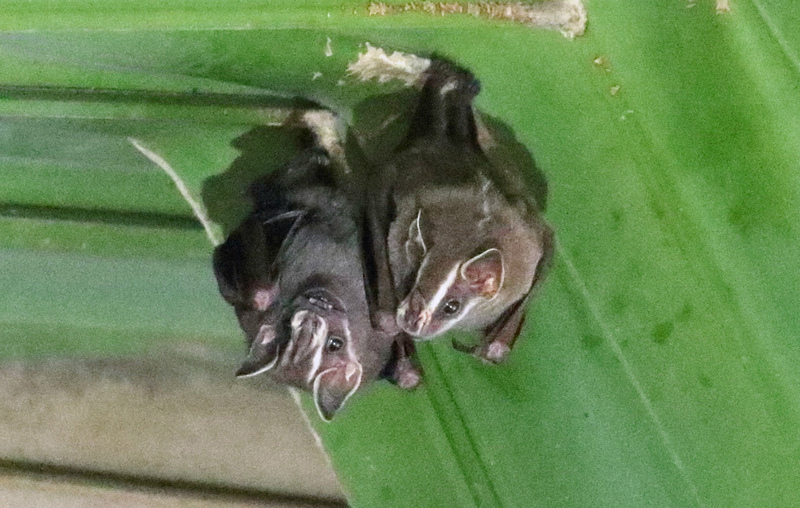 COMMON TENT-MAKING BAT (Uroderma bilobatum) – We made a stop at Summit Garden and saw at least three individuals huddled together under a large palm frond. 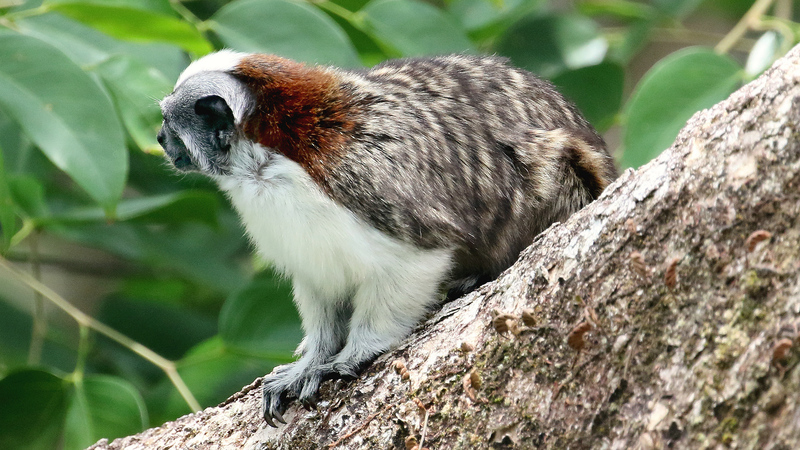 RED-NAPED TAMARIN (Saguinus geoffroyi) – We had a few views of these quite colorful primates at the Canopy Tower. GRAY-BELLIED NIGHT MONKEY (Aotus lemurinus) – Going off the trail, Alexis took us to a tree cavity that had two of these very cute guys peering out at us. A great sighting. WHITE-THROATED CAPUCHIN (Cebus capucinus) – A couple were seen when I was off doing something else. HOFFMANN'S TWO-TOED SLOTH (Choloepus hoffmanni) – We had a couple of these during our night drive on Semaphore Hill. BROWN-THROATED THREE-TOED SLOTH (Bradypus variegatus) – Also seen at night on Semaphore Hill, we saw another at Metro Park and again at the Canopy Lodge. NINE-BANDED ARMADILLO (Dasypus novemcinctus) – On our walk down Semaphore Hill on our first morning we heard a rather large creature scratching in the leaf litter which led us to this guy. BRAZILIAN RABBIT (Sylvilagus brasiliensis) – We saw one along Pipeline Road. I think its the first one I have ever seen there. VARIEGATED SQUIRREL (Sciurus variegatoides) – One was seen along Pipeline Road and another at the Canopy Lodge. RED-TAILED SQUIRREL (Sciurus granatensis) – This was a quite common visitor to the bananas at the Canopy Lodge feeder. ROTHSCHILD'S PORCUPINE (Coendou rothschildi) – Alexis spotted one during our night drive but it got away before we could get on it. CENTRAL AMERICAN AGOUTI (Dasyprocta punctata) – A daily sighting along Semaphore Hill, at Metro Park and at the Canopy Lodge. WHITE-NOSED COATI (Nasua narica) – We saw one or two along the road going up Semaphore Hill. This is known as Gato Solo, the lonely cat, in Panama.